Sussex geologist Rory Mortimore, an authority on the Chalk of northern Europe, has just published a new paper in the Proceedings of the Geologists’ Association on the deformation history of the Chalk. This comprehensive paper describes field examples from across the British Isles, northern France and Denmark, including important locations in our local area of interest. A feature of the tectonics across NW Europe is the reactivation of older basement faults during the Mesozoic and Cenozoic. Stresses applied by the opening of the North Atlantic and African Plate collision with the European Plate are considered to be the driving forces behind the inversion and reactivation of these faults. Only recently have the impacts of these tectonic fault movements on Late Cretaceous sediments been more widely investigated and demonstrated in the British Isles. The paper suggests that growth movements on many of the tectonic structures were underlying controls on the Late Cretaceous Chalk sedimentary history in terms of preserved thicknesses, lithology, erosion events and/or hard-ground formation and non-sequences. It is further suggested that these growth movements created the sea-floor slopes for gravity sliding and slump folding. Deformation structures formed during sedimentation range from early, shallow depth sliding and slumping, to deeper-burial level deformation of beds producing intense shearing. Later ‘post-Chalk’ uplift, faulting and folding driven by the larger faults created fold belts. The Chalk of southern England is characterised by lines of en-echelon periclinal folds, such as the Isle of Wight-Purbeck and Portsdown anticlines. The influence of these structures on Chalk sedimentation, especially the presence of sedimentary hiatuses, contemporaneous submarine channels and slump beds has been investigated. Evidence from interbed sliding and listric fault development in the Newhaven Chalk Formation in Sussex suggests that pore fluid pressure associated with marl seams is part of the process. Soft, high porosity chalk layers interbedded between more competent nodular chalk beds and hardgrounds also appear to preferentially develop slides (e.g. the Hope Gap Model, Seaford Head, Sussex). Scouring into the Chalk sea-bed producing synsedimentary channels is common at particular localities and stratigraphical levels. In some cases the channel-fill is very different to the underlying sediment (e.g. the Southerham Grey Pit Channel, Lewes). In the area around Lewes and Brighton evidence for repeated erosional channel-forming events and/or bed sliding can be found associated with a tectonic lineament the Kingston Anticline - Caburn Syncline pair. Mortimore, R.N., 2019. Late Cretaceous to Miocene and Quaternary deformation history of the Chalk: Channels, slumps, faults, folds and glacitectonics. Proceedings of the Geologists’ Association 130, 27-65. The complete paper can be accessed here: https://www.sciencedirect.com/science/article/pii/S001678781830004X. A new website has just been launched for the Etches Collection Museum of Jurassic Marine Life at Kimmeridge Bay. A new play, Dinomania, will be on at the New Diorama Theatre in Regent’s Place, London from 19 February to 23 March 2019. 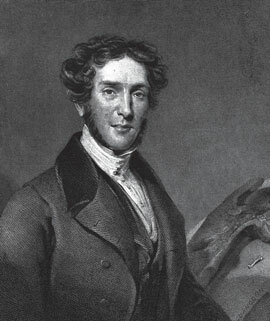 The play is about Gideon Mantell, the Sussex country doctor who dedicated much of his life to the study of the geology of Sussex and South-East England and was especially interested in collecting and studying fossils. It follows his story from the discovery of large fossil teeth at a quarry near Cuckfield in 1822. He recognised that they probably belonged to a large and unknown type of reptile and the play deals with the great difficulties he faced getting his ideas accepted by the sceptical and conservative scientific establishment of the day, notably Sir Richard Owen who eventually took much of the credit for discovering dinosaurs. Mantell never got the national recognition he wanted and fell on hard times after 1833 and after a carriage accident in 1841 he was permanently crippled and in pain until his death in 1852. He was in many ways a forgotten local hero. The Year of Carbon is an opportunity to showcase both academic and applied research focussing on energy, geochemical cycling, climate and materials, among many others. Events throughout the year will involve academe, industry, economists and government bodies, as well as partner geoscience societies and organisations. The society welcomes proposals for meetings and events aimed at a range of audiences to bring into focus the myriad of ways carbon underpins life on Earth. The site information for Warnham Brick Pit local geological site (Langhurstwood Quarry) on our website has been updated following a field trip to the quarry on 1st July 2018. The trip was led by Peter Austen who has provided updated information on the fossil record from this site. Also a set of photos has been added, taken by Peter Anderton from similar locations to the photos he took for a condition survey of the site in 2012. The new photos were taken in much better weather conditions. There is still time to enter the photography competition for the 2018 Earth Science Week (13-21 October). The deadline is midnight on 25 September. This year’s Earth Science Week photo competition follows the theme “Earth Science in our Lives.” The interest is in images which reflect geology that’s been important in your life – it might be a place you often visit, somewhere you’ve carried out fieldwork or simply somewhere close to where you live. As ever, the theme can be interpreted as broadly as you wish - your image might also be inspired by how human activity and geology interact, or the ways in which geology features in our lives through resources, outdoor activities or as inspiration for artists, writers and scientists alike. Enter by midnight on 25 September and be in with a chance of winning cash prizes, as well as featuring in the Geological Society’s 2019 calendar and the annual Earth Science Week exhibition at the Geological Society. For more information about the competition and how to enter use the link below. A great opportunity for imaginative photography! Geology is all around us impacting on our daily lives. It’s in our shopping baskets, our homes and our streets as well as on mountains, volcanoes, beaches and quarries. Send us your chosen photographs (up to 3) on any geological topic. These will be put on display at the Festival of Geology, University College London on 3 November 2018. First Prize £100, Second Prize £50, 3rd Prize £25. Your entries will also be considered for inclusion in the 2019 GA Calendar which will be on sale at the Festival and may be published in the Geologists’ Association magazine and used for publicising and promoting the work of the Association (full credit will be given). Geology Photographic Competition rules and entry form can be downloaded here. Please note the competition deadline of 14th September 2018. A newly published paper in the Journal of the Geological Society proposes that the major fold structures of Paleogene age in southern England are more likely to have been caused by the effects of Pyrenean mountain building rather than Alpine mountain building as commonly believed. The strata of southern England from Dorset to Kent experienced folding after deposition of the youngest strata in the Solent Group, the Bouldnor Formation, Rupelian age (early Oligocene). North-south shortening generated fold structures which are best exposed along the south coast where the coastal geomorphology arises from differential erosion of tilted and folded strata that form escarpments and cliffs. These major fold structures have long been attributed to distant effects of Alpine mountain building, known as the Alpine Orogeny, which occurred mainly in Oligocene and Miocene time. There is almost no direct evidence to support this interpretation. An improved method of uranium-lead dating of vein calcite formed in fractures during the Paleogene deformation has been used to determine the age and cause of the folding along the south coast of England. Samples were taken from the Purbeck coast and the Isle of Wight where the fold structures have larger amplitude and are well exposed. Fractures associated with folding of Late Cretaceous Chalk occurred from 36-33 Ma (million years ago). Fractures associated with deformation of Jurassic strata have veins with ages ranging from 55 Ma to 25 Ma culminating in folding-related fractures from 34-31 Ma. This folding was Rupelian, early Oligocene, in age, slightly younger than the age of the Bouldnor Formation Group. It is plausibly a result of far-field stress from the collisional mountain building of the Pyrenees (Pyrenean Orogeny) which culminated in the late Eocene. It is not consistent with the intraplate forces from Alpine mountain building during the early Oligocene. The Geological Society has announced that this year’s Earth Science Week is taking place on 13-21 October, with a theme of ‘Earth Science in our Lives’. To mark the Geological Society’s Year of Resources, they are highlighting the ways in which geology affects our lives through everyday objects, possessions, products and services, in the home and further afield - often in ways we don't expect. Earth Science Week is an annual international celebration of the geology all around us. Through public events like geowalks, hands on activities, talks and open days, organisations and individuals aim to raise public awareness of geology and how it affects our lives. It is coordinated by the American Geological Institute in the US and the Geological Society of London in the UK and Ireland, and also takes place in an increasing number of countries around the world. The Geological Society is inviting entries from schools for their Plate Tectonics Stories competition. The competition is open to primary and secondary schools and sixth form colleges. To enter teachers must submit samples of their students work (either digitally or physically) which brings plate tectonics to life and demonstrates some of the processes involved. This could be through scientific projects, artwork, model making, animations, videos whatever you like! Entries to the competition will receive a free A1 sized educational poster for their classroom as well as the chance of winning £150 worth of Earth science related books for their school. There's a chance to find out more about the park in South London where you can Walk with Dinosaurs - although these are not as we imagine them now. These Dinosaurs were ‘given flesh’ in the first attempt at three-dimensional life-like reconstructions when they formed the centrepieces of Benjamin Waterhouse Hawkins's inspired Crystal Palace geological islands. Ellinor Michel chair of the Friends of Crystal Palace Dinosaurs will speak in Lewes for the Gideon Mantell Memorial Lecture* about the challenges and importance of these models. She is a taxonomist and evolutionary biologist at the Natural History Museum. Date of talk Friday 9 February 2018 7.30pm at the Linklater Pavilion, Railway Lane, Lewes BN7 2FG. Entry £3. Contact for more information debby.matthews@yahoo.co.uk. * Mantell was born in St Mary's Lane Lewes on 3 February 1790 and spent much of his early life in Lewes as doctor, geologist, early palaeontologist and writer. Every year around this time we invite a speaker on a related theme to present a talk. A new book, Building Stone Atlas of Sussex, was published in November 2017. It is authored by local Sussex geologists Roger Cordiner and Anthony Brook and provides a well illustrated and comprehensive description and analysis of the traditional building stones of Sussex. Their flyer can be downloaded here (343kB) . D. A. Bone 2016. Historic building stones and their distribution in the churches and chapels of West Sussex, England, Proceedings of the Geologists’ Association, Volume 127, p 53-77. Historic England report 2015. Strategic Stone Study - A Building Stone Atlas of West Sussex (including parts of the South Downs National Park). Historic England report 2015. Strategic Stone Study - A Building Stone Atlas of East Sussex (including Brighton and Hove Unitary Authority). Two recently published papers describe significant fossil finds from the Wealden rocks of West Sussex. Tooth from ornithischian dinosaur, Ardingly. Scale bar 1 mm. The first is a paper about terrestrial vertebrate fauna from a bone bed in the Wealden of the Ardingly area. Unusually the fossils derive from sandstone blocks found ex situ in 2012 during building excavations at Ardingly College. Sedimentological investigations show that the blocks are from the Hastings Group, Ardingly Sandstone as well as the Grinstead Clay which underlies the building site. The bed containing the most abundant vertebrate fossils probably represents the top Lower Tunbridge Wells pebble bed. 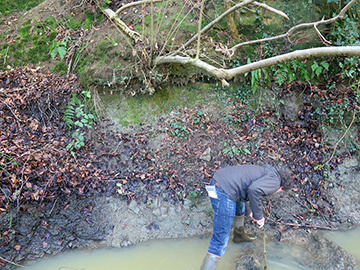 Exposures of Ardingly Sandstone at Wakehurst Place, one of our Local Geological Sites, and Balcombe Lane, Ardingly were studied together with local borehole and pit data to confirm the identification of the sandstone blocks. A tooth from an ornithischian dinosaur appears to represent a new taxon for the Wealden Supergroup. Teeth of the crocodilian Theriosuchus extend the known range of this taxon in the Wealden, while teeth of an ornithocheirid pterosaur confirm the presence of these animals in the skies above the Wealden basin. S C R Maidment, C Kirkpatrick, B Craik-Smith & J E Blythe, 2017. A new ornithischian dinosaur and the terrestrial vertebrate fauna from a bone bed in the Wealden of Ardingly, West Sussex, Proceedings of the Geologists’ Association, Volume 128, p 332-339. The second is a paper about fish otoliths found over a period of 10 years in the lower Weald Clay at Langhurstwood Quarry, one of our Local Geological Sites, and also at nearby Clockhouse Brickworks in Surrey. Otoliths are calcium carbonate infillings secreted in the inner ear of vertebrates. These recent finds represent otoliths from the saccular part of the inner ear of freshwater fish. Their form is species-specific and they can be used to identify taxa. Many of the specimens are densely packed on individual bedding planes and are interpreted as coprocoenotic accumulations, having passed though the digestive tracts of predators and been subsequently excreted in quantity. 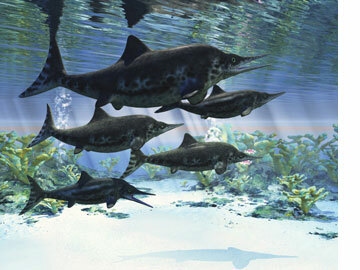 Other parts of the predated fish would probably not have survived the digestion process. 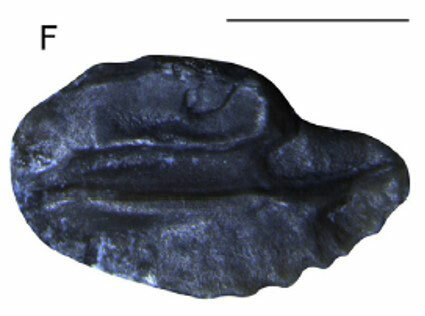 Fish otolith Leptolepis toyei from Lower Weald Clay, Langhurstwood Quarry. Scale bar 1 mm. Two new species are defined, Leptolepis wealdensis and Leptolepis toyei, which is named in honour of Sussex geologist the late Geoff Toye in recognition of his outstanding contributions to the palaeontology of the Wealden rocks. Professor Dan McKenzie's archive of notes, papers and correspondence related to his long career has been donated the Geological Society Library. His work was key to developing the ideas that led to the theory of plate tectonics and the archive includes his early work on plate tectonics and mantle convection. The library has just announced the launch of a new website, Plate Tectonics: the Dan McKenzie Archive, which celebrates his unique contributions to the most important discovery in the earth sciences during the 20th Century. The website tells his story, illustrated with papers and photos and also recorded interviews. The website is designed to appeal to a broad audience. A new paper in press by Andy Gale of the University of Portsmouth describes a distinctive succession of pelagic microcrinoid faunas in the lower Campanian chalks of Sussex, Hampshire, Isle of Wight and Dorset. He proposes a new zonation which provides an independent interpretation of the regional correlation of the Newhaven, Culver and Portsdown chalk formations, previously based on correlation of flint and marl marker beds. Hessicrinus cooperi - holotype cup. Scale bar 0.2 mm. 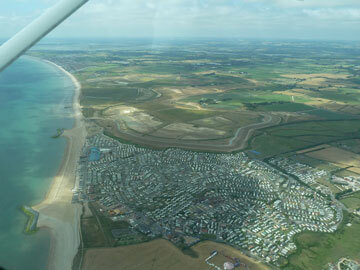 From 4 m above Peacehaven Marl; Newhaven. Amongst the key microcrinoid species described is a new species which he has named Hessicrinus cooperi in honour of John Cooper of the Booth Museum, Brighton, who did much to help his work on chalk fossils. Images of Hessicrinus cooperi are shown in Figure 4 of the paper. John is the founding father of geoconservation in Sussex and it is worth noting that most of the sites in Sussex which provided material for Andy Gale’s research are designated as Local Geological Sites (formerly RIGS) and are still accessible. They comprise coastal cliffs and inland chalk quarries. Costatocrinus mortimorei. Paratype radial plate. Scale bar 0.5 mm. From Cliff Dale Gardens pit, Cosham, Hampshire. In an earlier paper published in 2016 Andy Gale described the discovery of an abundant, diverse and largely undescribed microcrinoid fauna from the lower Campanian chalk of southern England and compared it with similar microfossils from the lower Campanian of Texas, Mississippi and southern Sweden. A number of new genera and species were identified including the species Costatocrinus mortimorei named in honour of the stratigraphical work of our local and international Chalk expert, Rory Mortimore, on the chalk of the Anglo-Paris Basin. 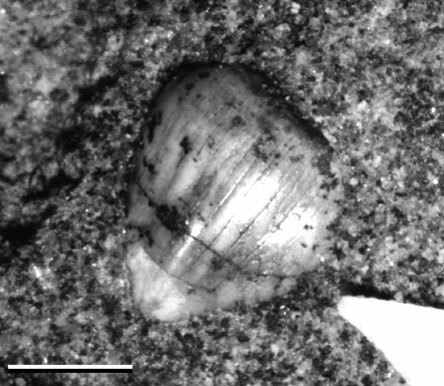 Images of Costatocrinus mortimorei are shown in Figure 4 of the paper. Gale, A.S., 2016. 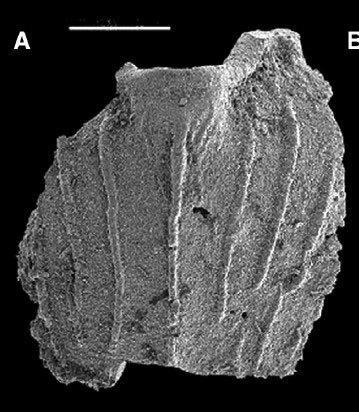 Roveacrinida (Crinoidea, Articulata) from the Santonian-Maastrichtian of England, The US Gulf Coast (Texas, Mississippi) and southern Sweden. Papers in Palaeontology, Volume 2, Issue 4, p 498-532. It would provide an impressive memorial to the achievements of Dr Gideon Mantell, the surgeon and geologist who was born and lived in Lewes. In 1822 he and his wife Mary found the fossilised remains of the first recognised dinosaur, later named Iguanodon. The proposed life-sized resin model would be 3 m high and 7 m long and an internationally renowned model maker in America is currently working on a scaled-down prototype. The model will be on view at the Depot Cinema on 16 September to tie in with a showing of 3D Jurassic Park. It will then be on view at the Fossil Fair on 17 September and possibly after that at the Linklater Pavilion. At the launch the directors of the Lewes Dinosaur Project will invite suggestions on possible locations for the giant dinosaur. 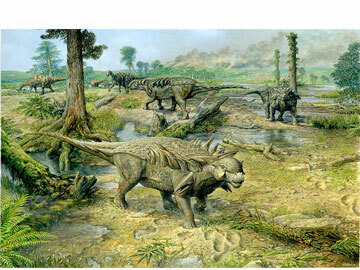 A news item in the Guardian reports the finding of a new fossil dinosaur in February at a brick pit in Surrey. The site, Ewhurst Brickworks, is owned by Wienerberger and is also widely known as Smokejacks pit. A nearly complete skeleton of a species of Iguanodon has been removed for investigation and cleaning at the Fossils Galore museum near Peterborough where the public can see the process at work. 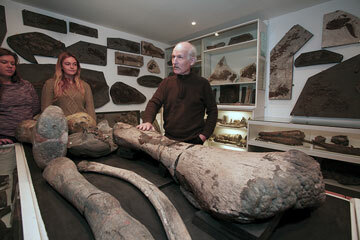 It is very rare to find a nearly complete dinosaur skeleton in the UK and this specimen will eventually go on display. Smokejacks pit has yielded a number of important dinosaur fossils. It is most famous for the finding of a new theropod dinosaur Baryonyx walkeri in 1983. Spring has finally arrived in the UK, and now is the time to get out and look for fossils. 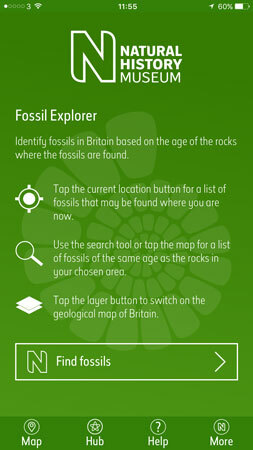 The Natural History Museum in London has just released a new version of the free Fossil Explorer app, a field guide to the common fossils of Britain that helps identify fossils based on where they are found. Whether seeking ammonites in Lyme Regis, marine reptiles in Whitby or trilobites in Girvan, beginner and more experienced collectors alike can learn about their finds and what else may be beneath their feet. Through Fossil Explorer, users have access to the combined expertise of the Natural History Museum and the British Geological Survey. Based on information from the Museum's popular British Fossils book series, the app offers details about more than 1,200 fossil taxa as well as local geology. Thanks to an interactive geological map, Fossil Explorer suggests likely fossil matches based on where they are found, giving a list of fossils known to occur in rocks of the same age. Introductory facts and illustrations help beginner fossil hunters get started, while additional information enables more experienced fossil collectors to delve deeper. New functionality in this release allows users to create and share lists of fossils they have found and set wish lists for future discovery. We hope the app will encourage budding citizen scientists around the country, inspire a new generation of explorers and get people thinking differently about the natural world. The app is available for iOS and Android. More information and download links are available on the Museum's website at www.nhm.ac.uk/fossilexplorer. A blog by Peter Campbell in the Guardian adds to the story of past Brexits (or Geo Brexits) covered in our previous news item (below). Actually this is mostly about the most recent separation of the British Isles from continental Europe which took place about 8000 years ago. This was the time when sea level rose after the end of the last Ice Age and gradually flooded the Channel and the extensive low lying Doggerland across the North Sea. It was a time of great significance for archaeology because Homo sapiens had by then arrived in what became the British Isles. So archaeologists are now looking for evidence of past landscapes beneath the Channel and the North Sea and associated evidence of human occupation. Dr Jenny Collier and Professor Sanjeev Gupta at Imperial College have just announced the latest results of their research on mapping and interpreting high-resolution bathymetric data from the Channel. Ten years ago they showed the presence of giant valleys in the sea floor in the central part of the Channel and proposed that they were evidence of a megaflood 450,000 years ago, caused by a catastrophic breach in the chalk land bridge (the Weald-Artois anticline) connecting Britain to the continent. This occurred during the maximum extent of the Anglian glaciation and they proposed that the most likely cause of the megaflood was the overflow from and emptying of a very large proglacial lake covering the southern North Sea area at that time. The new study by the team, working with their colleagues in Europe, now shows for the first time the details of how the chalk ridge between Dover and Calais was breached. New geophysical data in the eastern Channel and Dover Strait collected by colleagues from Belgium and France has been combined with seafloor data from the UK showing evidence of huge holes and a valley system located on the seafloor. The chalk ridge formed a huge dam which was eroded and weakened by giant waterfalls. Ultimately this resulted in failure of the dam and release of huge volumes of water. The holes in the sea floor appear to be plunge pools created downstream by the water cascading over the chalk dam. The research has also found evidence of a second megaflood, possibly 250,000 years ago. 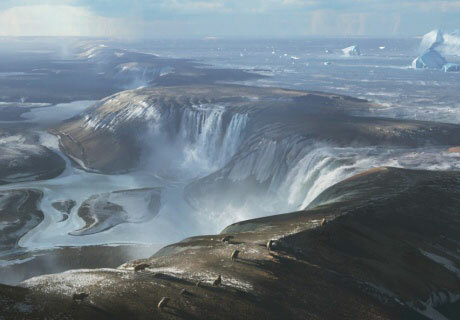 When the dam was breached at the time of the Anglian glaciation the sea level was low and the Channel area was dry land but in the subsequent warm period, the Hoxnian interglacial, sea level rose as the ice sheets melted and the first marine connection was established through the Dover Strait. This was the first of several "Brexits". Since then the changes of sea level through successive cold (glacial) and warm (interglacial) periods have caused land connections with the continent to alternate back and forth with fully marine conditions in the Channel and Dover Strait. The story of this research can be found on the Imperial College website under the title Brexit 1.0. S. Gupta, J. S. Collier et al, 2017. Two-stage opening of the Dover Strait and the origin of island Britain. Nature Communications 8, Article no. 15101. Artist's impression of what the land bridge between Britain and France may have looked like. S. Gupta, J. S. Collier, A. Palmer-Felgate, G. Potter, 2007. Catastrophic flooding origin of shelf valley systems in the English Channel. Nature 448, p 342-345. From Saturday 1st April to Friday 2nd June Littlehampton Museum together with the West Sussex Geological Society will host an exhibition entitled Underground Sussex. There will be a huge array of exciting rocks and minerals on display, which have been collected from around the county by the West Sussex Geological Society, on show alongside specimens from the Museum's own collection. This exhibition will be accompanied by geology identification sessions and fossil hunts. Rother District Council's cabinet recently discussed a proposed fossil collecting code of conduct drawn up by the Bexhill Museum. The need for a code has arisen following incidents of commercial and irresponsible fossil collecting creating damage to the beach environment and constituting a loss of important heritage material. Details of the proposed fossil collecting code of conduct are provided in a report to the cabinet (106kB) dated 13 March 2017 which recommends that the Council approve the code. A study of the porosity and permeability of selected Wealden sandstones is the subject of a recent paper by Oladapo Akinlotan at the University of Brighton. Akinlotan, O., 2016. Porosity and permeability of the English (Lower Cretaceous) sandstones. Proceedings of the Geologists' Association 127, 681-690. The study is based on samples of sandstones within the Ashdown and Wadhurst Clay Formations of the Weald Basin. Samples were collected from SSSI coastal sites in East Sussex at Rock-a-Nore (Hastings) and Haddock's Cottages and Cliff End (Pett Level) with permission from Natural England. 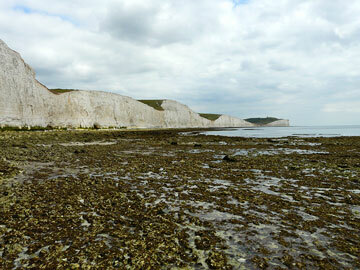 These sites are also designated as Local Geological Sites (Foul Ness, Fairlight Cove and Cliff End). The lower Ashdown Formation was sampled at Rock-a-Nore, the upper Ashdown Formation at Haddock's Cottages and the uppermost Ashdown Formation and the Cliff End Sandstone in the lowermost Wadhurst Clay Formation at Cliff End. Porosity ranges between 6.3 and 13.2% (average 9.9%) and permeability ranges from 0.4 to 11.9 mD (average 3.1 mD). The main controls on porosity and permeability are grain size, grain shape and degree of sorting which are directly linked to their fluvial depositional environments. Aim of Event: A growing demand on the supply of clean water is balanced by ever increasing constraints on the discharge of wastewater to the environment. We shall study how this achieved. Courtesy of Southern Water and Twyford Waterworks Trust, we start with a visit to the operating Water Supply Works and the historic Twyford Waterworks to understand the processes behind water abstraction from the Chalk aquifer and putting it into supply. The visits will be complemented at lunchtime by talks from the Environment Agency at the Phoenix Inn, Twyford, on how these activities interact with the hydrogeology of the Chalk and the environmental constraints that need to be taken into consideration. In the afternoon, courtesy of Southern Water, we visit Morestead Road Winchester Wastewater Treatment Works. We will see how wastewater is treated to a high standard before discharge and recharge of the Chalk aquifer. This is the largest waste discharge to groundwater in the UK. Field/Safety Equipment Needed: Sturdy and waterproof footwear. Hi-viz vest (provided by the Branch). Hard hat. Gloves (for use at the wastewater treatment works; rubber or disposable will suffice). The quarry was still being worked in 2012 but it has now been unused for about 4 years due to economic constraints. The operator Dudman Group had permission to extract remaining sand and complete restoration by 2 October 2016. In September 2016 Dudman Group applied to the South Downs National Park Authority to extend the permitted period for extraction and restoration to 2 October 2026, Planning Application SDNP/16/04886/CNDC. 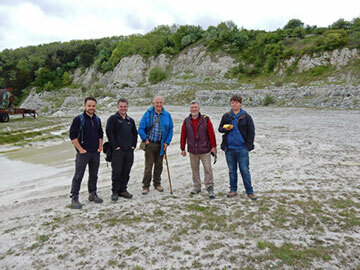 Novington Sand Pit has produced soft sand from the Folkestone Beds, mainly for use in mortar. Remaining sand reserves in the eastern part of the site are estimated to be 350,000 tonnes, representing about 9 years further extraction given prior constraints on the annual permitted tonnage. Restoration to landscaped lakes for biodiversity and recreational use is required. Consultation on this application closed on 13 January 2017. Sussex Wildlife Trust's submission notes that the site has been unused for about 4 years and is returning to nature so new biodiversity surveys should be carried out and the restoration plan reviewed. In the application the operator has failed to recognize the previously documented biodiversity and geodiversity of the site. East Chiltington Parish Council has objected on similar grounds, while Plumpton Parish Council opposes further stop-start sand extraction. On 27 January 2017 planning permission was granted for extending the period for extraction and restoration until October 2026 subject to the same operational and environmental constraints as previously approved. Steve Flitton, Worthing College Evening Class Geology Lecturer, can now confirm Beginners Evening Classes will run at Worthing College on Mondays, 7:00pm until 9:00pm from 9th January 2017 with the last class on 6th February. To enrol on these classes phone Tasmin at Worthing College 01903 275755 and select Admissions. The fee is is £60. The class will be aimed at beginners and people who would like to refresh their knowledge and understanding of Geology. It will make use of the extensive specimen collection at Worthing College. The planning application SDNP/14/00111/CND by Dudman Group for permission to continue sand extraction until the end of 2018 was refused in March 2015. After continued extraction at the site the South Downs National Park Authority issued an enforcement notice in August 2015 to close operations at the site. Appeal A against the original refusal of planning permission was dismissed. Appeal B against the enforcement notice was allowed. The enforcement was quashed and planning permission was given for continued sand extraction until the end of 2021 subject to new conditions. On 5 December 2016 Dudman Group applied for discharge of condition 4 of the planning permission with supporting documents detailing their proposals for the dealing with the various issues covered by this condition (SDNP/16/06089/DCOND). 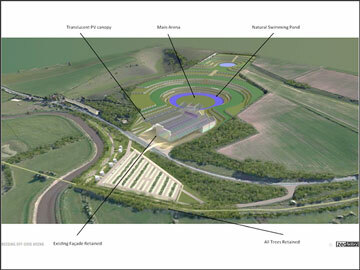 A proposed method for the future working and extraction across the site is presented. With the exception of the northern-most area, where the current processing plant area is located, the remaining permitted reserves lie beneath the current lake area. 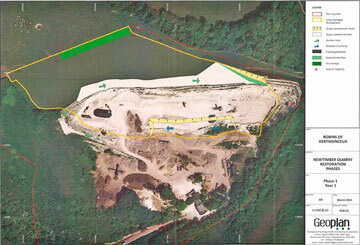 The extraction of the remaining reserves beneath the lake will be undertaken using a dredger. The dredger will use a GPS positioning system to ensure efficient underwater extraction and underwater surveys will check lake bed levels. Map of Heath End Sand Pit. Heath End Quarry - 2016. The proposed programme for restoration and aftercare of the site is the main item of interest for geodiversity and biodiversity. The central feature of the restored site will be a lake, landscaped and managed for conservation and “low key” amenity. Most of the lake will be retained as open water with reed beds along the northern shore. 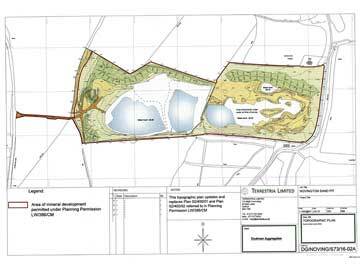 Around the lake restoration will comprise conservation grassland together with drifts of woodland and shrubs and two exposed sand faces. The exposed sand faces on the eastern and southern banks of the lake will provide habitat for sand martins and also expose the geology of the Folkestone Beds for future educational and research purposes. These retained faces will be engineered to be stable and about 4m in height. A report is presented to assess the impact of further extraction of sand on the stability of the Duncton Common round barrow cemetery, a scheduled archaeological monument. Based on the assumptions made, the analyses show that the overall stability of the final slopes is acceptable but the construction of the slopes must be carefully monitored to avoid any over extraction. This article updates the original report posted in September 2015 here. Research led by the British Geological Survey has revealed a 10-fold increase in retreat of chalk cliffs in East Sussex during the past 150 years. The studies, carried out at Beachy Head and Hope Gap, are based on measurements of beryllium-10 in flint nodules exposed in the wavecut platform. This shows how long the nodules have been exposed to cosmic radiation at the surface. Over a period of 7000 years the cliff retreat seems to have averaged 2.5cm per year at Hope Gap and 6cm per year at Beachy Head. This compares with 20-30cm per year recorded for the past 150 years based on topographic maps and aerial photography. The acceleration in retreat may be partly due to thinning of the gravel beaches which otherwise would protect the foot of the cliffs from erosion. Bexhill in East Sussex is well known for its dinosaur fossils, particularly those found in the Weald Clay at Ashdown Brickworks. However a dinosaur fossil found by an amateur fossil collector on a beach near Bexhill in 2004 has made headlines recently. 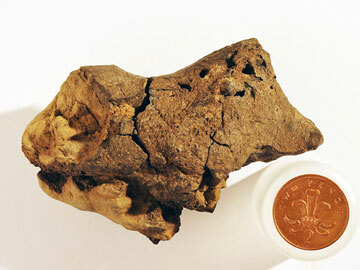 The fossil is a cast of a dinosaur's brain cavity probably from a relative of Iguanodon. Researchers who have studied the fossil at Cambridge University now believe that it shows a thin veneer of mineralised brain tissues on its surface. This would be the first evidence of fossilised dinosaur brain tissue and it is astonishing that such delicate tissues could have been preserved for 130 million years. 176 years ago, there was a keen amateur fossil hunter who, looking over lumps of stone waiting to be cut to build a new chapel for Horsham, saw a dark mass amongst greyish brown rock, which proved to be fossil bones. Little did George Bax Holmes realise that his discovery of these bones of the dinosaur Iguanodon would catapult him in to the world of The Great Exhibition of 1851 or inspire video artist Toby Tatum 170 years later. 30 years ago a keen amateur fossil hunter looked at a mass of grey clay at Rudgwick Brickworks and saw lumps of dark stone. Sylvia Standing rescued the material, which also proved to be dinosaur bones, before it was to be made into bricks. Little did she realise that after 30 years of research these dinosaur bones would be identified as a new genus by Dr William Blows and named Horshamosaurus rudgwickensis after her home town and that of George Bax Homes or that the Friends of the Horsham Museum would then commission the world’s leading dinosaur artist John Sibbick to recreate our dinosaur. Both fascinating stories and resultant artwork along with fossils remains are told and featured in the new temporary exhibition Dinosaurs of Horsham – art, reality and fun at Horsham District Council's Horsham Museum from 9 July to 5 September 2016. The Wealden clay and sandstones in the area around Horsham have been known for their dinosaur fossils since the 1820s when the first bones of Iguanodon were discovered. Subsequent discoveries led to 'dino-mania'. In Horsham, respected Quaker George Bax Holmes became interested in such fossils and geology. Around 1837 he seems to have collected his first fossil, then three years later he found further remains amongst the building material for a new chapel in the town: these bones became known as the Great Horsham Iguanodon. Thanks to a loan by Brighton & Hove City Council's Booth museum, Horsham museum can display some of these amazing fossils. The size of them meant that the remains became the model for a large replica that was unveiled in 1854 at the world's first theme park, Crystal Palace, after the Great Exhibition, together with replicas of other dinsoaurs. At the time understanding of dinosaurs was in its infancy so the replicas are somewhat fanciful. They still stand there today in Crystal Palace Park. In the early 1980s, Horsham museum volunteer Sylvia Standing led a small group to Rudgwick to rescue some fossils found in brick clay. The remains caught the eye of polymath Dr William Blows, who, in his spare time has spent years researching dinosaurs belonging to the genus Polacanthus. 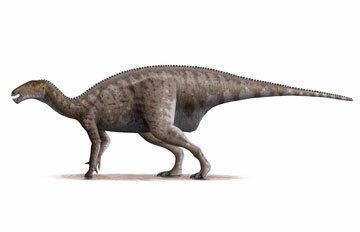 The fossils found at Rudgwick looked similar, but were different, and after further research they were assigned to a new genus Horshamosaurus. In the Victorian era, they transformed fossils into 3D sculptures; for Horshamosaurus, the Friends of Horsham Museum have commissioned the world's leading dinosaur artist, John Sibbick, to re-create the dinosaur in a painting so that we can see what it looked like. As well as displaying fossil remains, the exhibition Dinosaurs of Horsham also showcases the work of Reading born video artist Toby Tatum, who has produced a short film Monsters. 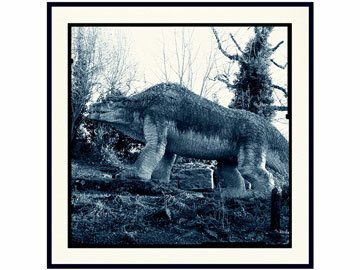 It features Horsham's Iguanodon along with the other dinosaur sculptures in the Crystal Palace Park. Toby has exhibited the film around the world at various film festivals and now thanks to the support of Toovey's Fine Art Valuers and Auctioneers the Museum is delighted to be able to show it in Horsham. It is the first time that video art has been shown in the museum and adds a different dimension to what will be an amazing multi-layered exhibition which tells the story of dinosaur discoveries and artistic interpretations. The museum is also delighted to be able to display Dinographica Britannica, a new work by French artist Adrien Sina who on New Year's day 2016 visited Crystal Palace Park, and captured the spirit of these amazing Victorian creations including the Great Horsham Iguanodon by skilfully blending these photographic images with those found in drawings of fossils from Sir Richard Owen's History of British Fossil reptiles. It adds amazing views to an exhibition that reflects the Victorian passion for modern technology looking at the past. A range of dinosaur summer fun sessions will complement the exhibition and a children's dinosaur themed trail around the museum will help keep the children entertained during the holidays. For more information on the children's activities see www.horshammuseum.org/whats-on. Dinosaurs of Horsham - art, reality and fun opens on 9 July and runs until 5 September 2016. The exhibition is multi-layered with elements that will appeal to all those interested in dinosaurs, art, scientific history, Victorian skulduggery and a lot more besides. This amazing exhibition would not have been possible without the support of the Washington based auctioneers and valuers, Toovey's. As part of the restoration plan for Cocking Chalk Pit the South Downs National Park Authority are considering the potential for long-term management of the site to preserve geological exposures and provide access to them in conjunction with management for biodiversity. 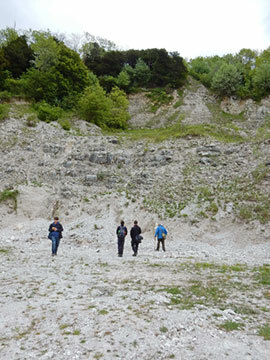 A site visit was arranged for 25th May to allow members of the Sussex Geodiversity Partnership to demonstrate the educational value of this quarry. The SDNPA was represented by local rangers Ian McConnell and Sam Buckland and the SGP by Rory Mortimore, David Bone and Peter Anderton. This is one of the few pits exposing a Chalk section of mid-Turonian age. We started in the upper part of the quarry where the lower New Pit Chalk is well exposed and finished in the lower part where the upper Holywell Nodular Chalk is also well exposed. Most of the section is easily accessible from benches and the large quantities of debris at the foot of each bench provide plenty of material for close examination. Rory’s nephew Josh Shearing took GPS reading at key points which could be included in a geological trail. Rory gave us a guided tour and showed how wide the educational opportunities are for this site. The Holywell and New Pit chalks each have their own distinctive physical properties and were quarried for different uses. Fractures in each chalk unit are distinctive. Some marl and flint layers are also present and act as marker horizons traceable over large distances from southern England to eastern Europe. Fossil assemblages change from the base to the top of the section reflecting evolutionary and environmental changes. Chalk was deposited in a marine environment where seas were more acidic and shows abundance of sponges rather than corals. This may be relevant to modern ocean environments under global warming. The landscape of the South Downs reflects the varying properties of the underlying Chalk formations. The properties of the Holywell and New Pit chalks determine the shape of the main escarpment of the South Downs. The Cocking wind gap and dry valleys visible to the west of the pit raise questions about their origin during the Quaternary period. The site is easily accessible with safe areas for viewing the geology and examining rocks and is suitable for groups from primary school age to Sixth Form and university. It would also be a good site for demonstrating the physical properties of the chalk units to engineers and geotechnicians engaged in large construction projects. Ideally the restoration of the quarry should leave the geological exposures and benches available for permitted access via a marked geological trail. Rory has sent a report to the SDNPA proposing a geological trail for Cocking Chalk Pit. Upper part of quarry exposing New Pit Chalk. Left to right: Sam Buckland, Ian McConnell, David Bone, Rory Mortimore, Josh Shearing. Lower part of quarry exposing the full section from Holywell Nodular Chalk in the lower face to New Pit Chalk in the higher face. 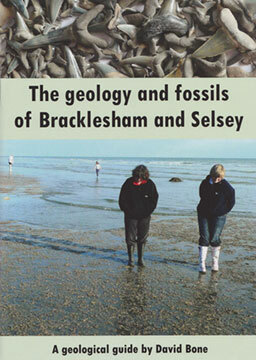 The geology and fossils of Bracklesham and Selsey. This new and well illustrated guide provides an excellent introduction to the geology and fossils of Bracklesham and Selsey based on David Bone’s extensive experience and knowledge of the area. It replaces his 2009 guide to Fossil Hunting at Bracklesham and Selsey. Since 2009 major coastal changes have resulted from the Environment Agency’s scheme breaching the shingle beach at Medmerry and the new coastal defences at Bunn Leisure holiday camp and the new guide takes these changes into account. Most of the guide is focused on the geology of the Bracklesham Beds of Eocene age with their wide variety of fossils but there is also space devoted to Quaternary deposits in the area. David offers practical advice on where and how to hunt for fossils along Bracklesham Bay together with general advice of collecting fossils. Space is also devoted to other geological finds along the beach and to aspects of coastal erosion. This guide should be an essential reference for anyone interested in fossil hunting along Bracklesham Bay or wishing to appreciate the geological history of the area. The book costs £4.00 and is available from the Novium Museum, Chichester or by post from David (extra £1.30 p&p at cost). His address is 4 Kensington Road, Chichester PO19 7XR and his email is david@dajbone.plus.com. The South Downs National Park Planning Authority has received a restoration plan for Cocking Chalk Pit from the landowners, The Cowdray estate. The plan allows for natural regeneration, which should be a positive thing from a bio-diversity and landscape perspective. This report proposes a restoration plan for the Cocking Chalk Pit using the methodology of natural recolonisation. The plan is to create a species-rich calcareous grassland site characterised by grasses and herbs dominant in a chalk downland landscape. The plan considers the various existing uses of the site other than mineral working, as well as the need to preserve the historic geology now evident from the previous workings of the chalk pit. 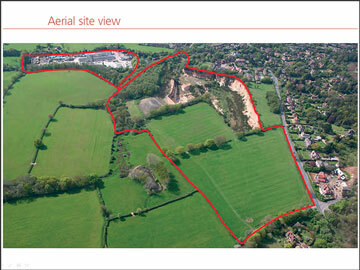 The Cocking Chalk Pit restoration plan can be downloaded here (2.82MB) . The SDNPA would welcome any comments on this plan. 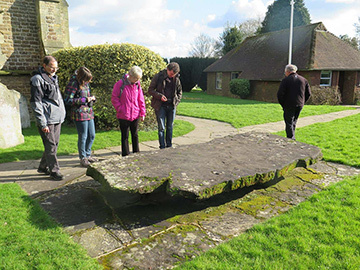 Peter Anderton, Aurélie Thiebaux, Gill Woodhatch and Sibrecht Reniere examining large slab of Horsham Stone in Warnham churchyard. Sibrecht Reniere, Roland Dreesen, David Bone and Aurélie Thiebaux discussing Okehurst Sandstone samples at Coppedhall Hanger local geological site. 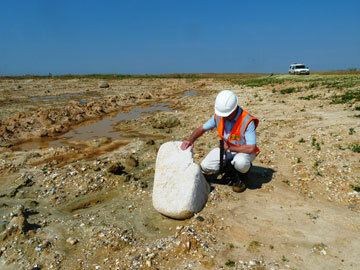 Sibrecht Reniere collecting samples of Okehurst Sandstone from stream bed at Coppedhall Hanger local geological site. 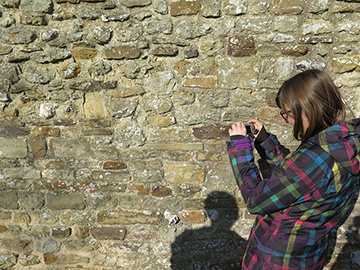 Aurélie Thiebaux taking a photograph of a flaggy sandstone in the wall of the Church St Mary the Virgin in Shipley. 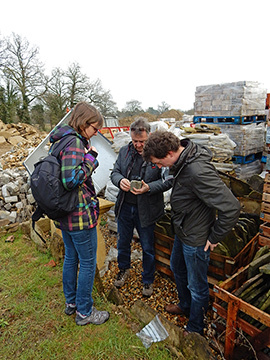 Aurélie Thiebaux, Roland Dreesen and Sibrecht Reniere examining samples at Horsham Stone & Reclamation yard, Broadbridge Heath. 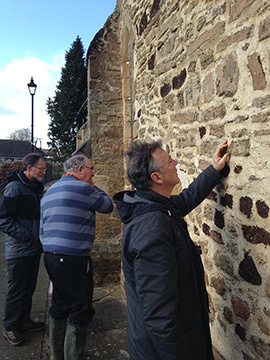 Peter Anderton, David Bone and Roland Dreesen examining a variety of sandstones in the wall of St Mary's Church, Billingshurst. 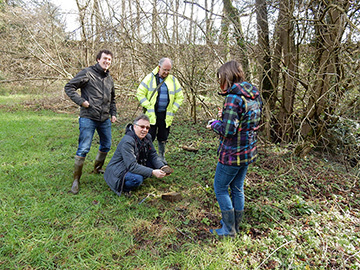 On February 17 to 19 2016 three Belgian researchers (two archaeologists, Sibrecht Reniere from University of Ghent and Aurélie Thiébaux from University of Liège , and one geologist, Roland Dreesen from University of Ghent) visited West Sussex. Both archaeologists are actually working on a PhD that focuses on Roman stone tools in Gallia Belgica and Germania Inferior: whetstones, millstones, quern stones, ointment palettes, etc. One of the aims is to determine geological and geographical provenances. These can inform us on distribution patterns and the Gallo-Roman socio-economics. For the geological aspect of the research they have the petrographical support of several geologists. The visit had one main goal: learning more about the provenance of Roman whetstones made from a very distinct imported sedimentary rock, found on Belgian and French archaeological sites. Based on the research results of Prof. Allen (University of Reading) flaggy calcareous sandstones of the Wealden Clay formation are suspected as most probable geological sources. The first day of our stay we discussed the subject with Prof. Allen and had a look at several thin sections of British samples. These were petrographically compared with thin sections from our Belgian archaeological samples. The second day the aim was to have a look at some outcrops and locate potential geological sources in the western Weald area. Without the help of the local geologists, this would have been impossible. Gill Woodhatch, David Bone and Peter Anderton accompanied us during our visit to the Horsham Stone and Reclamation site in Broadbridge Heath where we could take samples from the typical Horsham stone. Later on they guided us through the local landscape to show us a Wealden sandstone outcrop, the Okehurst Sandstone at Coppedhall Hanger. After a nice lunch where cross-channel contacts were forged, we visited some historical buildings in the surroundings to have a look at a variety of local quarried and used building stones. Some of them showed a potential good match with our "Wealden sandstones". Unfortunately we didn't find any outcrops that could be the ultimate source for the production of the Roman whetstones. With 30 or more lenticular sandstone beds in the Weald Clay formation, it is like searching for a needle in a haystack. Nevertheless we learned more about the local landscape and the geological potential for an important whetstone production during Roman times. Even more important, we got to know some people who share the same passion: geological and archaeological heritage. To be continued. Finally we want to thank Gill (Horsham Geological Field Club), and David and Peter (Sussex Geodiversity Partnership) for their hospitality. Without their support and guidance our stay would have been far more difficult and less productive. In 2014 Southern Water proposed to use the site for an Aquifer Storage and Recovery (ASR) project. A pilot borehole was planned for 2015 but is now postponed until problems with site remediation can be resolved (January 2016). Southern Water ASR leaflet can be downloaded here (211kB) . Although the Gault Clay SSSI at the eastern edge of Horton Clay Pit will be buried during the final stage of landfilling of the former pit, the site retains significant geological interest because of the Pleistocene deposits overlying the Gault Clay at its western edge. These deposits appear to record the progressive infilling of a channel of the River Adur marking a transition from relatively cool climatic conditions to the onset of cold periglacial conditions. This sequence, unique in Sussex, has yielded a rich fossil assemblage, ranging from large herbivores to beetles and pollen, providing evidence of the environmental changes. A description of the deposits and the history of excavation has been prepared by Dr Matt Pope, UCL Institute of Archaeology and can be downloaded here (87kB) . In November 2015 a site meeting was arranged between the site manager (Viridor), Matt Pope and Peter Anderton (Sussex Geodiversity Partnership) to see how development of the site since 2000 has affected the deposits and to assess the possibilities for further investigations. A central area between the angling pond and the site office appears to be still intact and available for further work, so provisional agreement has been reached for ground clearance and exploratory coring in spring 2016 and possible excavations later in the year. 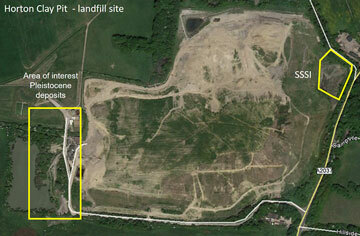 Map of landfill site showing area of interest for Pleistocene deposits. In March 2013 the operators submitted an application for a periodic review of minerals planning permission allowing chalk extraction until 2042. 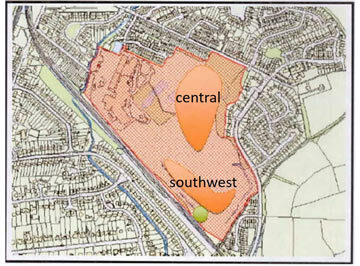 This was approved by the South Downs National Park Planning Authority in January 2014 (SDNP/13/02439/ROMP). The approval is subject to a number of conditions including submission of a fully detailed landscape restoration and aftercare scheme for the site. This was submitted in April 2015. The scheme proposes 5 phases of restoration up to 2042. The restored landform will be created by progressively cutting 5 to 10 m individual high faces each separated by 5 m wide benches. The design gradient is shallow enough to accommodate and limit degradation processes likely to cause retreat of faces at crest until stability equilibrium is established. Newtimber Chalk Quarry Phase 1. Newtimber Chalk Quarry Phase 5. The quarry is in the final stages of sand extraction and the operators Dudman Group had permission to extract sand until the end of 2013. In December 2013 Dudman Group applied to the South Downs national Park Authority for permission to continue sand extraction until the end of 2018, Planning Application SDNP/14/00111/CND. The applicant had not demonstrated how much sand reserves remain and how they would be worked and processed on site. The applicant had failed to demonstrate that the proposed development would not adversely impact on the Duncton Common Round Barrow Cemetery, a Scheduled Ancient Monument. This decision is currently subject to appeal which started in June 2015. 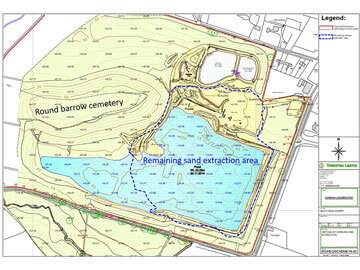 After cessation of sand extraction the owners are required to restore the site for biodiversity and recreational use. The quarry is in the final stages of sand extraction and the landowner, Wiston Estate, and the quarry operator, Dudman Group are considering plans for infilling the site. In their December 2014 Newsletter the Washington Parish Council asked resident to have their say on the future of Rock Common Quarry and register their interest in being invited to attend a community workshop. In the July 2015 Newsletter the council reported that a meeting was called by Dudman Group with the Wiston Estate to discuss the future of the sand pit. The meeting was well attended. However the problems with the future of the pit and the adjoining Windmill Quarry site are still unresolved. Two reports in the County Times in March and April aired local residents’ concerns about proposed plans for infilling the site. The local community are opposed to this and would like to see the site become a nature reserve or home to an environmentally based project. Our August news item on Rudgwick Brickworks mentioned the most famous fossil found there, the dinosaur Polacanthus rudgwickensis. However, following a reassessment of the fossil material, Polacanthus rudgwickensis has been placed in the newly erected genus Horshamosaurus. In 2010 Croudace Homes Ltd and Keymer Tiles Ltd were granted outline planning permission by Mid Sussex District Council to develop the site for housing. One of the conditions for approval was the requirement to arrange for palaeontological recording during the site investigations and associated earthworks. 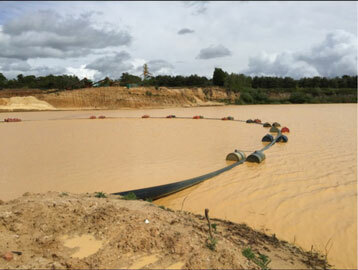 Clay extraction ceased in 2013 but the factory continued to operate until 2014 using the stockpiles of material on site. A proposal from the Natural History Museum for geological and palaeontological recording during the site excavations was approved in 2014. This aims to mitigate the loss of geological and palaeontological interests following development of the site. 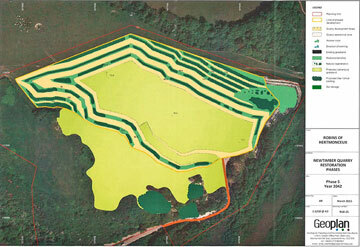 Map of Keymer Tileworks showing areas of proposed site investigation (orange) and retained conservation section (green). Croudace submitted planning application for Phase 1 of the development in August 2014. Phase 1 covers the factory site only. This application 14/02830/REM can be viewed on the Mid Sussex District Council website. Aerial view of Keymer Tileworks showing area of Phase 1 of the housing development (red) coinciding with the tile factory site. As you may know, the Geologists’ Association is running a photographic competition this year which is open to anyone and we are keen to receive as many entries as possible. It is a great opportunity for imaginative photography! All the entries will be put on display at the Festival of Geology, University College London on 7 November 2015 and there are impressive cash prizes! Entries will also be considered for inclusion in the 2016 GA Calendar which will this year be on sale at the Festival of Geology (full credit will be given). Map of Water Lane SINC. Northern end of upgraded section of the lane with infill of cherty sandstone aggregate quarried from Hythe Beds of the Lower Greensand. The Blue Rag and malmstone outcrops have been buried. 25/07/2015. Water Lane is an historic hollow lane linking West Worldham and Alton cutting 20ft down into the Upper Greensand Formation. Its historic interest is linked to its geological interest as mentioned by Gilbert White in his world-famous classic work The Natural History and Antiquities of Selborne 1789. It is a route that that he routinely travelled along on his way to Alton. For the most part the site is effectively a stream or gorge. This is especially so to the north, downstream, where water runs along the base of the lane and there are banks either side up to four metres in height. The stream runs along bedrock in the northern section and the bedrock is often exposed up the sides of the banks as well. Water Lane is already a Site of Importance for Nature Conservation (SINC) at county level for its old woodland indicator species of plants, microclimate, ferns. It is a wildlife corridor. Malmstone in moist pockets of these lanes is also a substratum for interesting mosses. Most of lane is cut in Upper Greensand Formation with varying lithology from malmstone in the south to blue rag in the central section. Blue rag is a hard siltstone which forms the floor of the lane. There are very few exposures of blue rag in the area. Towards the northern end sides are less rocky as the more shallow part of the hollow lane cuts through the West Melbury Marly Chalk Formation. The Upper Greensand Formation is nationally limited to the western Weald and Wessex while the blue rag is even more local. The latter was used by Gilbert White’s grandfather for the Selborne village street in the early eighteenth century. There are very few exposures of malmstone and especially blue rag left that are safely accessible and not at the side of a busy road with cars. The rocky hollow lanes through the malmstone give excellent views of the lithology and processes of geography but most of them have been surfaced with tarmac and incorporated into the modern highway network. As Water Lane was replaced by a new road (B3006) in mid 19th century it continues to provide a walkway and shows the lane floor as it was in earlier times, with both historical and aesthetic interests. Whilst there are other hollow lanes in the Lower Greensand Formation of the western Weald e.g. around Haslemere, Surrey they are of an acid iron-rich sandstone, a different lithology with different flora and fauna compared with the Upper Greensand Hollow lanes. 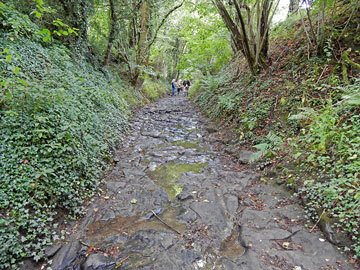 A special feature of Water Lane is the hydrology and its effect on the rocks, flora and fauna. Arable fields on the malmstone bench give rise to surface run-off and there are also spouts into the lanes from bedding planes and the aquitard effect of the blue rag. In winter there is running water down slope for the whole section but especially so from a tributary gully. This water enters the Caker Stream, part of the Wey catchment. One does not want imported rock with different lithology affecting the water chemistry. Also it is valuable to keep the accessible teaching opportunity for demonstrating processes of erosion by water. The lane is classified as a BOAT (Byway Open to All Traffic) and is part of a planned new trail, The Writers’ Way. As part of countryside access work to upgrade the BOAT as part of The Writers’ Way Hampshire County Council have started to cover up the natural bedrock and put in drainage pipes. As the work involves a natural water course, as well as placing foreign rock material obscuring the local geology and potentially affecting water chemistry to the Caker Stream, Ordinary Watercourse Consent is required under the Flood and Water Management Act 2010. Works have therefore been stopped for the time being. Hampshire Biodiversity Information Centre (HBIC) recently requested geological advice from the Sussex Geodiversity Partnership to determine whether the Water Lane site should be designated as a Regionally Important Geological Site (RIGS), also known as Local Geological Sites. On 25th July David Bone and Dr Peter Anderton representing Sussex Geodiversity Partnership joined Nicky Court (HBIC) and Dr June Chatfield to inspect the site. The weather was very favourable, a fine day after heavy rain, so the watercourse over the Blue Rag siltstone could be observed with significant water flow. 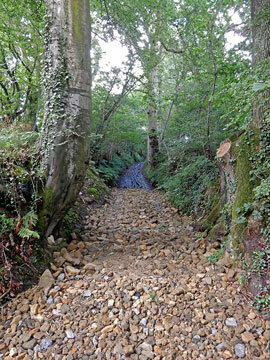 The contrast between the natural bed of the lane to the north and the upgraded section to the south was very evident. Cherty sandstone aggregate from the Hythe Beds of the Lower Greensand used to upgrade the lane has buried the natural malmstone and is very different in colour and composition. The concensus after the visit confirmed that the site clearly met the criteria for designation as a RIGS (or LGS). Documentation is now in progress. Rudgwick Brickworks claypit was closed in 2012 and the site was subsequently sold. In April 2015 a waste planning application to West Sussex County Council for restoration of the site by infilling the pit was approved subject to conditions which include some recognition of the site’s geodiversity value as a Local Geological Site (RIGS). The application reference number is WSCC/38/14/RW and relevant documents can be downloaded from the planning website. Details were provided in a report to the planning committee in October 2014. This report concerns a proposal by R Harrison & Sons to restore Rudgwick Brickworks, a former claypit. Restoration would involve the use of 622,500 tonnes (415,000m3) of inert wastes/materials over a period of four years. 590,100 tonnes (393,400m3) of restoration material would be imported by road, to be used along with extracted materials/wastes already on site, which will form the balance of the total amount of material. Restoration of the claypit would enable the future use of the site as grazing land for the applicant’s dairy herd alongside the adjacent Woodsomes Farm estate. The proposed development, when restored, would result in a landform similar to that prior to clay extraction but containing significant improvements in terms of benefits to the wider landscape and in terms of agricultural afteruse and benefit within the locality. Existing mature planting adjoining the claypit would be retained and protected. 2.11 There are no statutory landscape, ecological or historic designations within the site. The southern and eastern areas of the site are designated as a Regionally Important Geological Site (RIGS), considered to be of regional importance for geodiversity. The site is not within an area identified as being at increased risk of flooding. It is not within a groundwater source protection area. The Brickworks itself is recorded within the County Council’s ‘Sites and Monuments Records’. 3.6 The site and adjacent brickworks were most recently operated (from 2006) by Wienerberger but production became unviable and both clay extraction and brick production ceased in 2012. 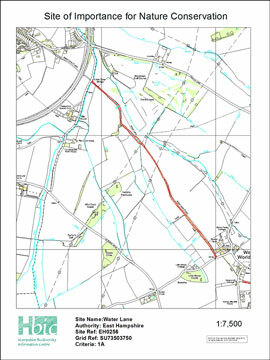 The proposed final landform aims to reinstate the original contours of the surrounding land prior to clay extraction..........Existing clay and overburden stockpiles on site would be graded back and incorporated within the overall phased restoration scheme along with the imported materials. 4.19 The final landform would have slopes not exceeding gradients of 1:12 to allow for modern agricultural operations to be carried out. It would have open fields enclosed with trees and hedgerows, as well as new woodland planting and a hedge between (north of) the former brickworks and restored claypit. 4.20 Surface water would be managed through the creation of ditches running to new and existing ponds on the western and southern boundaries of the site. An area of clay would remain exposed in the north-eastern corner of the site for future geological study relating to the site’s designation as a RIGS. The planning application was granted subject to a number of conditions which are specified in the decision notice. The development hereby permitted shall not take place until landscaping, restoration and aftercare details have been submitted to and approved in advance and in writing by the County Planning Authority. (e) The measures, including mitigatory works, to be taken to protect and incorporate the site’s exiting and historic features of archaeological, ecological and geological interest into the restoration scheme and how such features would be managed in the long term following completion of the restoration. One of the last field trips to the Rudgwick Brickworks claypit was organised by the Geologists’ Association in 2007. A report can be found in the Magazine of the GA, Volume 6, No. 4, December 2007, pages 16-17 and the last page. This report includes photos of fossils found during the visit. Recently proposals have been put forward for reuse of the former Shoreham Cement Works and quarry, Upper Beeding. This chalk quarry is designated as a Local Geological Site (former RIGS) which does not have the statutory protection of a Site of Special Scientific Interest. It is a very large quarry with excellent exposures of the Lewes Chalk and Seaford Chalk formations and is currently leased to Dudman Group for recycling of building waste. It is encouraging that the site is not being proposed for landfill. A number of earlier proposals to reuse the site have been unsuccessful. However the current proposals appear to be based on wider consultation and community involvement and are innovative. At this time the plans are at a conceptual stage but it seems worth following their progress to identify opportunities to provide input to any future planning application review. The Beeding Quarry is considerably larger than the former Bodelva Quarry which houses the Eden Project in Cornwall so it has the potential to host a major tourist attraction. It certainly has enough space to allow industrial heritage, geodiversity and biodiversity preservation alongside proposed business, leisure and cultural activities. There is no specific mention of geodiversity in the policy but there is potential for its inclusion within the overall framework. The Cement Works is of great public interest and is part of the history of Upper Beeding when it was the major employer and source of income in the area. In a recent survey within the Parish 76% identified that the Cement Works was a major issue and needed something to be done to it. The Upper Beeding Neighbourhood Plan wishes to identify opportunities for development and employment at the site as part of a regeneration and restoration package for the Cement Works. Any proposal for development must deliver the principal objective of securing the satisfactory restoration of the site with major environmental and landscape improvements compatible with the site's sensitive location in an Area of Outstanding Natural Beauty within SDNP. There are opportunities for development and such sites have been transformed from industrial to recreational and business use very effectively while retaining the industrial features of interest and value. ensure that opportunities are maximised to enhance the landscape and biodiversity of the area whilst protecting the existing wildlife habitats. be a comprehensive scheme for the whole site. include development that is necessary to secure the satisfactory restoration of the site. provide the community access to open spaces, social, cultural and educational benefits, well-being and inspiration from interaction with nature supported by a strong healthy economy. Build South Downs Visitor Centre with parks, camp site, shops, cafe, Youth hostel, stables, and cycle centre. Wild Life Centre and Sanctuary for birds, fish & plants. Utilising the river. An imaginative proposal to develop the site has been produced by the Upper Beeding community as described in Upper Beeding Parish Council Newsletter for March/Spring 2015. As you know we carried out a questionnaire back in 2014 asking people for their key issues and 74% said they would like to see something done to the Cement Works Site rather than it being left as an eyesore and blot on the countryside in SDNP. Having visited the site owner Hargreaves, Dudmans (who have an option to buy) and the SDNP (the Planning Authority) it seemed pretty clear that nothing was going to happen for another 20 years unless we tried to do something about it. All did say they liked some of our ideas but.......... So with the help of some willing professionals Bill Dunster (Architect), Alex Hole (Business Strategy & Planning) and Mat Bulba (Project Manager, Director of The Low Carbon Trust & Blooming Futures - Green Fuels) turned the community's ideas into some innovative proposals that can be properly funded. Since then we have presented to Coast to Capital (Enterprise Board), SDNP and circulated the proposals to Horsham & Adur District Councils and WSCC who have all supported and liked the ideas. We have presented again to the SDNP Executive & Members and are waiting their views on what they might permit being developed on the site. Shoreham Cement Works - existing. Shoreham Cement Works - proposal. It is quite clear that the proposals formed from a lot of ideas from the Community and approved in principle by the UB Parish Council are very different to those being proposed by Hargreaves but are by no means set in stone. A lot depends on who and how much we can get to invest. Once we get some indication from SDNP on their intentions we will hopefully be in a position to hold some public meetings in the Parish to present the proposals more widely and get feedback. The Off Grid Project was formed as a positive response to a series of negative proposals put forward for The Shoreham Cement Works site - one of the biggest brown field sites in the South East situated in the Heart of the South Downs national Park. Working with and Building on the local Parishes neighbourhood plan - A team of experienced Architects, Project Managers and Financial Advisers have put together a regeneration master plan that will meet the needs of the local community while enhancing the Public experience of the National Park. Set against the current global need to cut carbon emissions the project will offer the chance to experience low impact living first hand - The heart of the project gives visitors to the National Park a chance to sample a snapshot of a zero carbon / zero waste future that is fun and actually works well. The proposal will bring new life and employment opportunities into the area within a vibrant zero energy development containing an entertainment venue for open air performance. Our proposal uses landscaped terraces to repair an industrial scar on this cherished part of the countryside. We will sensitively create desirable holiday accommodation within a vaulted amphitheatre that can host the worlds leading musicians and performers. We will return plants and wildlife to this degraded environment and generate all running power from on-site renewable energy. The iconic industrial buildings will be retained, renovated and enhanced with the addition of a translucent solar roof. Our proposal will safeguard existing jobs and create new employment that responds to the unique context of the national park. By providing a new cultural offer it will create an exciting new role model for developments in the national park. The proposal is supported by a large number of images and plans which demonstrate the imaginative scope of the project. Recently proposals have been put forward for reuse of the currently inactive Chantry Mill Quarry, designated as a geological SSSI, a GCR site and a Local Geological Site (former RIGS). The proposals are encouraging because they appear to provide for preservation of part of the quarry for its geodiversity value as well as adding value for biodiversity. Usually sites like this seem destined for landfill. At this time the proposals are at a conceptual stage but it seems worth watching this space for opportunities to provide input to any future planning application. The economic, social and tourism benefits arising from the scheme can clearly outweigh any adverse environmental impacts. 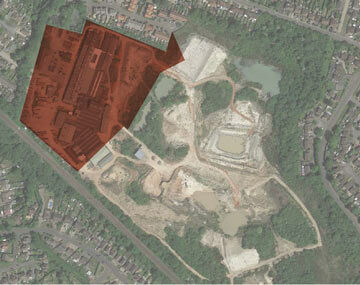 4.52 The proposals for the former Chantry Mill Quarry relate to only that part of the larger site. They are intended to encourage the reuse of the site for a new tourist attraction for the area, which again complements the Core Strategy and HDPF tourism policies and Policy 2v of the SSWNP, which allocates the adjoining industrial estate for employment and housing uses. They acknowledge the safeguarding of potential future minerals deposits (as defined by the West Sussex Local Minerals Plan) and the provisions of the conditions for the restoration of the quarry workings. The policy also requires proposals to take into account the designation of part of the wider site, but not the developable area, as an SSSI and its location within the setting of the National Park. 7.19 The proposals for tourism development (Policy 7) are divided into three parts. The first two parts offer qualified support for proposals to reuse former and current minerals workings for tourism and community facilities. Given neither proposal is that well developed at present, the policy falls short of allocating the land for these purposes. However, it is known that both sites – Chantry Mill Quarry and the area forming the Sandgate Country Park – have a range of biodiversity value (most notably the Chantry Mill SSSI) as well as some potential landscape (National Park) and heritage (the Chantry Mill heritage asset) value. Though both proposals are intended to deliver strong economic (7A) and/or social benefits (2A), the policy qualifies its support for these proposals in such a way as to ensure planning applications satisfactorily address any potential conflicts with biodiversity (3A), the National Park setting (4A) and heritage (5B) policy objectives. As both proposals relate to the beneficial reuse of minerals workings, the policy acknowledges the requirements of those proposals to accord with approved restoration conditions and the wider policy provisions of the West Sussex Minerals Local Plan. 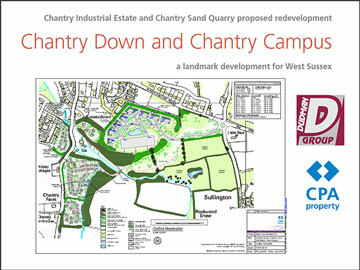 Also accessible from the home page this website is a proposal from Dudman Group, the current owners of Chantry Mill Quarry, for the redevelopment of Chantry Industrial Estate and Chantry Sand Quarry. Chantry Mill Quarry: site plan. 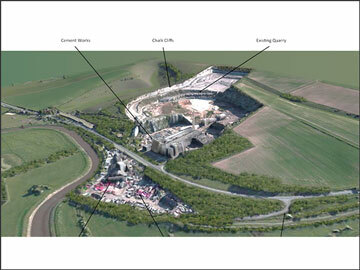 Chantry Mill Quarry: arial site view. The proposed uses for the quarry area have wide and varied possibilities, all of which would be using this resource in a positive and innovative way. Commercial, institutional, health, educational or leisure uses – or a mix – could all play a part in these imaginative ideas. 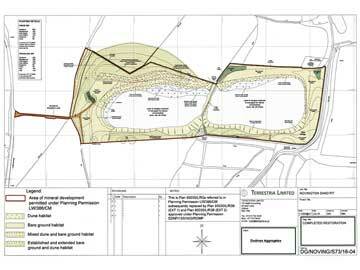 The scheme provides for new and existing natural landscaping, improved access, parking, public open space and attenuation ponds while retaining mature woodland (which has current permission for removal). They alleviate the threat of traditional landfill use and importing a major volume of materials for quarry restoration after further sand extraction. Sand Quarry Existing Use: Quarry has permitted use and is still a viable working sand quarry with demand re-emerging however the continued working has the owner operators’ conscious landscape impact concerns. Quarry & Restoration: The Quarry requires restoration upon completion and much consideration will need to be given to all of the adjoining properties including the Sussex Down (former RAFA) Residential Care Home, less than 6 - 10 metres from the Quarry edge. There is continual vermin and weather erosion to the quarry edges. Traffic management will need to be considered fully to allow all these works to take place and a new access may need to be considered as beneficial. In years past, normally a site with such large volume area would have been considered for Landfill. However the proposals alleviate the threat of Landfill use and the need also for the import of a major volume of inert materials for the whole of the quarry restoration after any further sand extraction. Proposed Sand Quarry site design: this will allow a development providing a unique ‘Campus’ environment, suitable for relocated local businesses with the opportunity for incoming new businesses or an institutional or educational campus for primary and/or secondary education could be considered, all of which will provide employment. The proposals will encompass elements of the vernacular in the residential design with modern amphitheatre design, using minimal ground space while stabilising the quarry walls. The Campus allows for an amphitheatre design, with the double effect of the ‘design and build’ construction to stabilise the sheer quarry walls for the long term and complete restoration but leaving the quarry floor with sympathetic contours and water management systems. Landscape: proposed developments do not impinge on landscape or views and the development is taking up the sides of the quarry rather than building on the quarry floor. 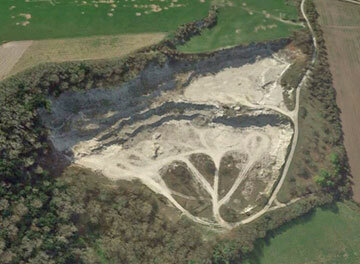 It is proposed part of the quarry sides will remain once the total site has been made safe for natural habitat. Mature Woodland: The proposals allow for the mature woodland which under current permissions to the South West boundary, would be removed in the normal course of sand extraction will remain and new planting increased throughout. Geodiversity: the conservation of part of the Quarry will provide safe access to continue geological features for ongoing sampling and study and to allow for site after-use which includes geodiversity objectives for education and heritage. Biodiversity: the proposal will allow existing flora and fauna and natural habitats in the Quarry to continue and expand. Category A: Any and every aspect of the Geology, Geomorphology and Geologists of Southeast England, defined as the counties of Kent, Surrey and Sussex, i.e. the area known as The Weald. Category B: General geological topics, by residents of Southeast England, as so defined. It will be a free-access Website, enabling all or part of any material to be downloaded, free of charge, by anyone, anywhere in the world, at any time. Material should initially be submitted in Word Format (.doc, NOT .docx) files, for ease of editing. After final approval, they will be formatted as a searchable PDF, for uploading on to the Website. It may be any (reasonable) length (text, references/bibliography and all illustrations), and contain as many illustrations as required (colour if available). Images should lie within the range of 300-600 dpi. returned as unsuitable or inappropriate. It should be well-researched, well-written and well-referenced, with clarity of expression uppermost, and also be as exact and accurate as possible. It should borne in mind that a PDF is a vertical electronic publishing format, rather than the customary lateral format of a book or periodical. It is Portrait rather than Landscape in shape; double-page spreads are, therefore, inadvisable. Material submitted for publication on this Website should not have been previously published in any other publication, in any format, except in special circumstances. Authors may use any recognised referencing system, so long as all quoted material is clearly referenced to its original source-author, publication, date, pages, etc;-- retain their copyright of any material published under their name on this Website;-- must obtain permission/licence to reproduce any material, particularly maps and illustrations, that is still in copyright, pay any necessary fees before submission, and provide written confirmation;-- must also certify that it is all their own work, and not copied or plagiarised, in any part or way, from any other source;-- submit textual material in Times New Roman 11-point, justified both sides; with 25mm margins, and begin a new paragraph by indenting 4 spaces, without inserting a line space between paragraphs;-- attend most rigorously to correct grammar, spelling and punctuation to enhance their submission;-- and also be aware that copies of their work will be created for archival purposes. Authors should also submit an Abstract (max. 400 words) to form the first Section of the document. Every Illustration must have a caption and a consecutive Figure number. As well as a Figure number and a title/caption, Maps should also have an indication of scale and a key to symbols, plus a north point/data source, if necessary. Due to rain infiltration and slope slippage of the soft Gault Clay this site has become unstable and its condition has been assessed by Natural England as Unfavourable-Declining. Natural England does not consider that long-term remediation is possible. Consequently the site will be buried and infilled with waste conformable with the adjacent existing landfill which occupies most of the former clay pit. restoration planting and seeding to improve the range of habitats provided for the completed landfill restoration. Burial will preserve the geology but restrict access in the future. 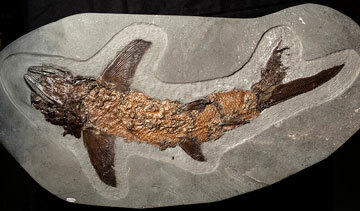 It was long thought that the Kimmeridge Clays had little to yield by way of well-preserved fossils. This belief was changed by the amazing discoveries of Steve Etches, a fossil collector and expert local to Kimmeridge, who over the past 30 years has discovered, collected and researched over 2000 incredible Late Jurassic Kimmeridgian specimens. This is an achievement that has resulted in a collection of the most extensive and finest fossil specimens ever found in the Kimmeridge Clay Formation. Many of the species Steve has discovered are new to science and are of great palaeontological importance. Each find has been perfectly curated, providing an immaculate record that reveals every aspect and tells the stories of these incredible creatures from deep time, how they bred, how they lived and died. Limited space means that the collection is not currently housed together and viewing can only be made by appointment. In 2008 the Kimmeridge community formed a collaborative Trust. Their objective is to provide a secure and permanent home for The Etches Collection, making it readily accessible to all and conserving it as a national treasure. In early 2013, the owner of the Smedmore Estate gifted land on which to build a museum. Steve also gifted his priceless collection to the Trust. Plans are well advanced to create a unique museum for The Etches Collection based in Kimmeridge, especially designed to give an engaging and educational experience with which the local community can also be fully involved. It will be a place that will become a major attraction to the many visitors that frequent the village and Kimmeridge Bay each year as well as a variety of new audiences. Visitors will enter the Exhibition Gallery and be taken on an immersive journey through life underwater 150 million years ago. The ceiling space will be transformed into an aquarium of the past delivered by CGI projection. Below, the fossil collection will be showcased in illuminated cabinets. The specimens will be carefully presented and interpreted to bring to life their individual stories. The museum will also include an educational and research area and a visible workshop enabling the careful extraction and preparation process to take place so that the collection can continue to develop and expand. The delivery and construction plan is underway and is set to achieve completion and opening of the museum in early 2016. The project has already received substantial financial support to build the museum but will need continuing support and sponsorship to maintain the facilities and develop the educational and research programmes. To find out more about how you could help support the museum, become a friend or be involved in the project, please register your interest by emailing to info@theetchescollection.org. The Geological Conservation Review (GCR) is a milestone in geo-conservation. The GCR identified sites, of national and international importance, that demonstrate the key elements of Earth History within Great Britain. The GCR forms the basis of statutory geo-conservation in Great Britain; a site must be a GCR site before it can be considered for protection as a Site of Special Scientific Interest (SSSI). The scientific description of each GCR site is being published in a series of GCR volumes incorporating the insights and expertise of generations of leading geologists. Some 34 volumes were published by the Joint Nature Conservation Committee (web-site: http://jncc.defra.gov.uk/page-2731); many more were planned. In 2011 the Geologists’ Association took over publication of further volumes through Special issues of the Proceedings of the Geologists’ Association (PGA). Essentially, each volume provides exceptional reviews of current knowledge, plus a series of geological site descriptions (extremely useful to assist field excursions). Three Special Issues have been published in the PGA and others are planned during the next few years. Also, it is intended that descriptions of any new GCR sites to emerge will be published in the PGA. Electronic PDF files of chapters within the Special Issue GCR volumes are available via the PGA website; in addition hardback and softback copies of these Special issues can be purchased (on-line) from Elsevier our publication partner. A “how-to-do-it flyer” from Elsevier is attached to this note. The following volumes are available for purchase in hardback or soft back. Further volumes are expected once these are completed. Chalk has proved to be one of the more difficult rocks to core-log as it breaks up readily during the drilling process leading to core-loss and destructuring, particularly where flints, nodular chalks and/or fractures are present. One of the greatest difficulties is the identification of chalk engineering grade which relies heavily on fracture aperture. Obtaining the correct grade to define the depth of weathering and the depth at which fractures become closed is essential whether for tunnels in London or for wind turbine piled foundations in the offshore chalks. Very few geologists and engineers have had the opportunity to study field sections in the Chalk so there is little visual appreciation of the grades or the variation to expect or even what flint bands look like. To partly overcome this difficulty, both field and core sections are illustrated in this book. Equally important to recognising Chalk grade is the building of conceptual ground models for construction projects. This can only be achieved if the various Chalk formations, beds and marker beds can be identified from cores and then boreholes correlated using the marker beds. The Chalk stratigraphy is accordingly covered with key formations and marker beds illustrated, and the best field sections for viewing them identified. This book is based on the standard lithostratigraphy and method of engineering description of Chalk developed over many years. Also important are over 3000 onshore and offshore chalk-cored boreholes undertaken by the author over more than 30 years. In addition, typical lithologies and weathering profiles representing the Chalk formations likely to be encountered in the various onshore and offshore construction projects are illustrated using field exposures, rotary core samples and geophysical borehole wire-line logs. There will be geological settings where information on the Chalk is poor and unexpected lithologies and stratigraphies may be found. This book will enable geologists to work from first principles to construct a lithostratigraphy and define weathering boundaries. As a geotechnical engineer based in the south-east of England (particularly London), there are several soil and rock units that I encounter frequently; The Lambeth Group, Thanet Sand, London Clay and Chalk. Chalk is one of the harder units to log for several reasons. Assigning strata boundaries in the chalk can be tough because at first glance the chalk can appear uniform (it is not). Recovery in chalk core can be pretty poor and often a geology degree or eurocode logging course will not cover chalk specifics that are essential for proper detailed logging of the chalk. 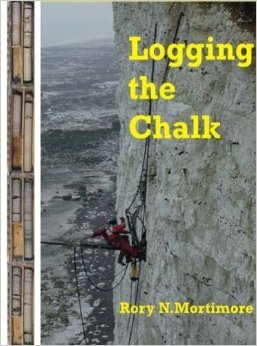 This book is (and will be) regarded as the chalk logging bible for any engineering geologist/ geotechnical engineer who encounters chalk in the field as a logging engineer or for people reviewing written logs back in the office. Its steep price genuinely reflects the quality of material within. Of particular use is the large colour annotated photographs of the kinds of things that I could encounter while logging (trace fossils, marker beds, marl seams, various flint types etc). Often core photographs are laid out next to graphic logs of the same sequence as an example of how chalk core can appear in the field. For those who encounter the chalk in the field, this is the ultimate reference book. Rory Mortimore has visited many ground investigation sites over his career and this is the book people like me have been asking him to write for years. Supported by the Geologists' Association, theBrighton and Hove Geological Society, the Horsham geological Field Club and the History of Geology Group. If you wish to attend please download coplete and return the Conference registration Form (63kB) . A BBC report on 27 February shows a large crack that has recently appeared at the cliff top at Birling Gap following the recent cliff falls in January due to the severe winter storms. (http://www.bbc.co.uk/news/uk-england-sussex-26373624). Average rate of erosion of the Sussex Heritage Coast chalk cliffs is ~1m/year; in reality, after years of no erosion, along comes a big one, often due to winter freeze-thaw, though this time it ws down to the total saturation of the cliffs battered by the severe storms. (http://www.bbc.co.uk/news/uk-england-sussex-25603539). The recent series of severe storms battering the south coast will undoubtedly be reshaping the cliffs and foreshore to a significant extent. A spectacular cliff collapse at Rock-a-Nore, Hastings on 3rd January was captured by camera and shown on BBC News (http://www.bbc.co.uk/news/uk-25604696). The collapse is located in the Foul Ness Local Geological Site and a photo taken in 2011 showing the pre-collapse state of the cliffs at this location is shown as photo 2 in the site description for Foul Ness. The event highlights the instability of these cliffs where thick massive sandstones overlie a sequence of weaker siltstones and thinner sandstones. About 2 km of foreshore around Bracklesham Bay will be affected by the gradual retreat (probably over decades) of the existing shingle bank that will no longer be maintained by the Environment Agency. This foreshore falls within the area designated as a geological Site of Special Scientific Interest for its Palaeogene and Quaternary geology. Every effort has been made to minimise damage to the SSSI area during construction of rock groynes and other works associated with the scheme, so any impact on the foreshore outcrop and existing geological exposures will only become apparent as the impact of high tides and storms gradually rolls back the shingle bank towards the new flood embankments. Some interesting geological features have appeared during excavation of the borrow pits and new drainage channels, some of which cut through Quaternary raised beach deposits. Of particular note was the discovery of several large erratic boulders of non-local rocks such as granites (Photo 2). Although these are found around the coast and occasionally from inland excavations, the Medmerry scheme revealed a number of these boulders in situ and also enabled a comprehensive collection of a large suite of rock types to be made from an abundance of smaller examples. The erratics range from boulders a metre or more in diameter down to cobble-size specimens. The rocks are believed to originate from Brittany or the Channel Islands, where similar rock types occur, and were ice-rafted across the English Channel during the Ice Age – but a lot more research still needs to be carried out. 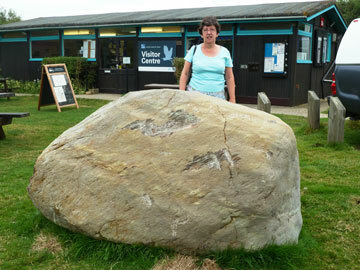 Three large boulders have been saved to form a future educational feature on the site (location to be decided), but the largest is currently located by the visitor centre at the nearby Pagham Harbour Local Nature Reserve on the road to Selsey (Photo 3). "Fracking" or to give it its technical name hydraulic fracturing is currently very much in the news nationally and in Sussex with the test drilling by Cuadrilla at Balcombe. Hydraulic fracturing has been used offshore for many years for improving the recovery of gas and oil from conventional sandstone reservoirs which have low permeability (so-called "tight" reservoirs). Water under high pressure is injected into the rock to generate open fractures which allow the oil and gas to flow more freely to the well bore. The present controversy and debate is about the use of hydraulic fracturing onshore for the extraction of gas and oil from shale rocks. Shales are essentially impermeable and the oil and gas contained in them can only be produced via the open fractures generated by hydraulic fracturing. Unlike conventional oil and gas reservoirs, which are localised, the shale reservoirs occur over wide areas and produce for relatively shorter times so that many more wells need to be drilled. Apart from the termporary site disturbance associated with all drilling and production activities several other environmental issues have been identified with hydraulic fracturing. These include the potential for groundwater and surface water pollution, the local demand for large quantities of injection water and the potential triggering of earth tremors.